With nearly a hundred miles of shoreline, Clear Lake is ideal for paddlers and wildlife enthusiasts to explore the sloughs or take on a rigorous workout in the open water. A series of water trails were thus developed to help orient new paddlers and visitors to the lake, as well as provide interesting natural and historical information of these areas. 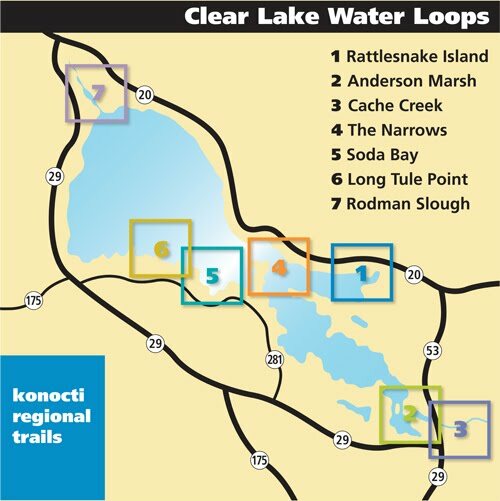 Click here for a map of public access points on Clear Lake. 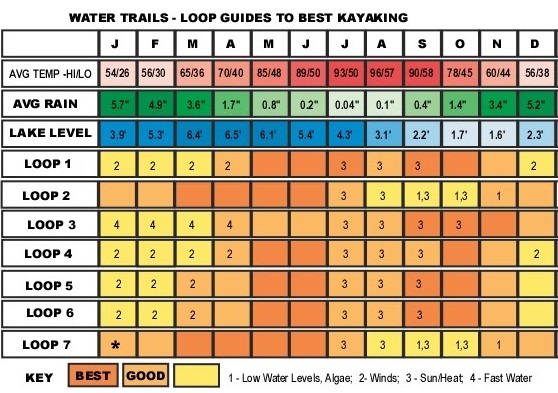 Water trails are recreational waterways on a lake, river or ocean between specific locations, containing access points and day-use and/or camping sites for the boating public. Water trails emphasize low-impact use and promote stewardship of the resources, while providing healthy, outdoor activity. Click on the numbered box to view the corresponding water trail page or scroll down to the links below to get the PDF files. Before starting a journey, boaters should become knowledgeable about local conditions such as currents, rapids, flow levels, weather, and hazards. New or unfamiliar equipment should first be tested. Leave word with a responsible person concerning your destination and when you will return. Always make sure your craft is in good repair. Have all gear either securely fastened within the craft or in waterproof containers that will float high and be easily retrievable. Learn how to swim, how to apply first aid and CPR. Paddlers are harder to see from other vessels. Keep paddling groups together. Watch for and avoid hazards such as fallen trees, brush, fences, bridge abutments, or old pilings. Do not boat under the influence of alcohol or drugs. All canoes and kayaks as well as inflatable rafts must carry a U.S. Coast Guard-approved personal flotation device (life jacket) for each person aboard.Additional recommended equipment includes protective foot gear, such as tennis shoes, bailing device, boating maps, flashlight, compass, first-aid kit, boat-repair materials, knife, and a 50-100 foot throw rope. Prepare for extreme weather, hazards, emergencies. Respect Wildlife. Observe wildlife from a distance. Avoid disturbing wildlife during sensitive times: mating, nesting, raising young. Leave What You Find . Preserve the past: examine, but do not touch, cultural or historic structures and artifacts. Leave rocks, plants and other natural objects as you find them. Always ask permission before entering private land. Unless posted, assume the land is private property. Remember sound carries across water more clearly than on land. Avoid loud noises or boisterous behavior. If you see anything suspected to be a pollution or disturbance of the waterways, report it immediately by contacting the Lake County Sheriff’s Department at 707-263-2690; California Dept. of Fish & Game at 888-334-2258. Always wear a personal flotation device (life jacket). Get out of the water as fast as you can since you get colder faster in water than air. Immediately towel off and get into dry clothes.